Adding a Great Room to your living space can change EVERYTHING! A Great Room is a great way to change the dynamic in your home. A great room is a large, centrally located room which has several functions afamily room, dining room and possibly kitchen. The popularity of family-style entertaining has made formal living rooms "out" and great rooms are "in". 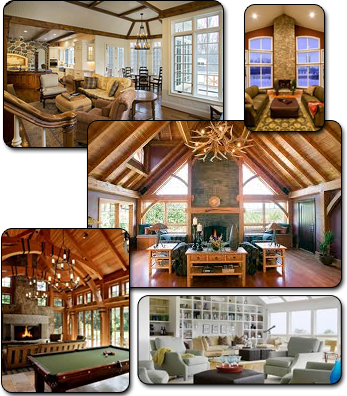 Often a great room might feature high ceilings or a something as elegant as a fireplace. It is typical in suburban houses, although open, multifunction rooms also are popular in many other settings. Traditional houses contain aliving room and a kitchen, but modern houses might contain a great room as the heart of the house. This large gathering room is used for entertaining and either replaces the family room and living room or it is even used as a dining room. Cultural changes have affected room usage and given rise to the great room. As larger televisions, video games and computers have become the primary source of at-home entertainment, many homeowners have needed additional space for all of their new gadgets. A great room usually showcases multiple architectural features, such as a vaulted ceiling, which might have exposed beams or might extend two stories high. It usually is a centrally located room and has many large windows that let in lots of natural light. Great rooms often boast a fireplace, even in warmer climates. Although the term great room typically is used in the suburban United States, many countries have embraced the idea of large, multifunctional rooms. Scandinavian homes are reputed for their open-space concepts with many architectural features such as high ceilings and lots of natural light. City dwellers who live in lofts or smaller studio apartments often combine cooking space, living space and sometimes even sleeping quarters in the same room. If you have an idea for an amazing great room in your living space, let us know. We will be happy to design something upon request.